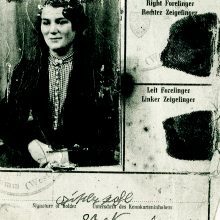 Gisela Pohl was arrested in Hamm in March 1943 and deported to Auschwitz-Birkenau along with her family. Both her parents and four siblings fell victim to the genocide. She and one sister were the only ones to survive the camp. 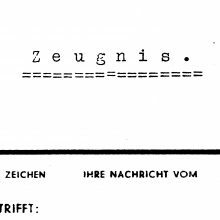 In August 1949 her former employer, the Tengelmann company, issued Gisela Pohl a favourable reference. By contrast, in a statement made in October 1950, Hugo Beneze, the criminal police officer involved in the deportation, denounced his former victim as ‘anti-social’. 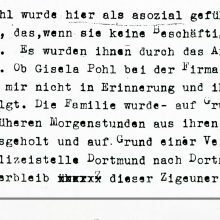 Gisela Pohl’s claim for compensation for wrongful imprisonment was rejected and any persecution of the family on racial grounds repudiated. It was only in the 1970s that Gisela Pohl received compensation payments for the injustices suffered; by then she had developed a serious heart and lung condition as a result of her imprisonment at a concentration camp.